When downloading a new app, you may obsessively comb through all of the fancy bells and whistles until you have fully devoured your new download. Then you return to the business of life and incorporate the app into everyday living. However, sometimes during this process the basics of the app get missed or even skimmed over. 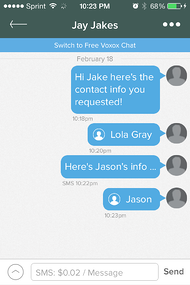 Today we are going to review the basics of adding a contact and sharing a contact via chat or text message. 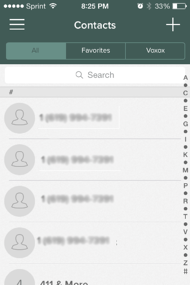 It sounds easy, it is easy, this is simply a quick refresher to streamline how you use Voxox for iOS. 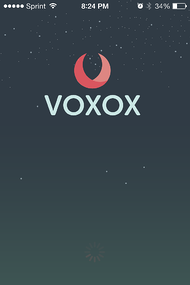 The first step is to start Voxox for iOS. When the app loads it will open in your Messages. Quickly swipe your finger right. The main menu will appear, next open Contacts with a quick press of your finger. 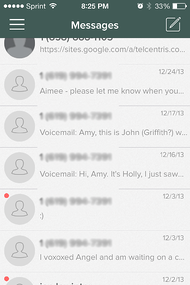 Once in the Contacts screen click the plus sign in the upper right corner of the screen. 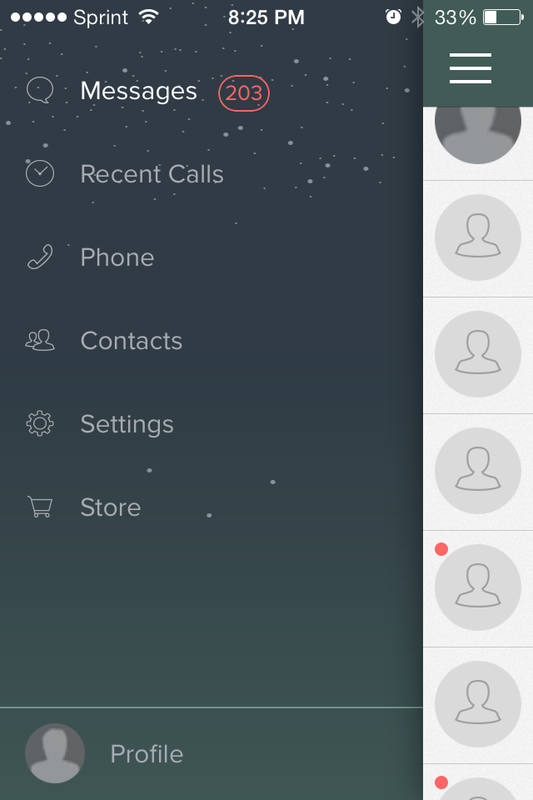 This will open the New Contact screen. Enter the information and click done. If you want to see the contact you just created type their name into the search bar and voila your contact appears. Click on your newly added friend. 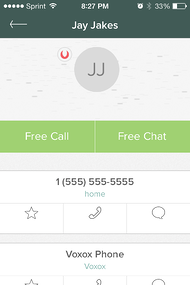 To send your friend the contact info of another friend simply click on the Free Chat button. 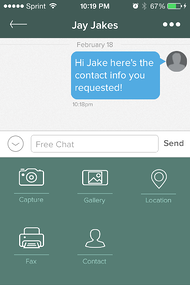 Send your friend a quick chat to let them know you are sending the contact info they requested. After you send the message, open the drawer by pressing the down arrow next to Free Chat. 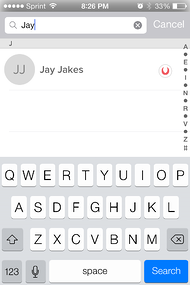 Next select Contact then select the contact you want to send to your friend. Select Done. 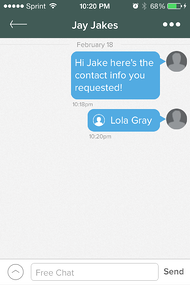 Voxox quickly attaches and sends the contact you selected to your friend, in this case we sent Lola Gray's contact info to Jay Jakes. Sending the contact info via text message is another great option to use for sharing contacts if your recipient is not yet a Voxox user. There is a small 2-cent charge. Simply go back to the main screen and press Messages. Send the person a quick text letting them know you are sending them a contact. Press the down arrow next to the SMS message to open the drawer again. Select Contact. 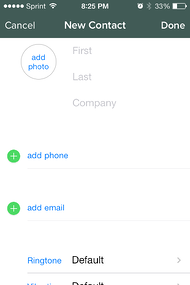 Choose the contact info you are going to send and select Done. You have now sent a contact via text message. This time we sent Jay Jakes the contact info for Jason. Now you have the inside scoop on creating a contact and sending contact info via Free Chat or SMS message. 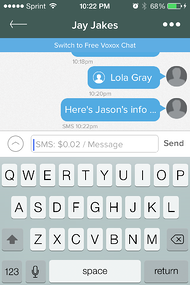 Sending a contact via Chat to another Voxox user is always free, and sending an SMS message to a non-Voxox user will incur a small 2-cent charge. Both methods are quick and easy! Furthermore, with Voxox the ability to send an SMS message to a non-Voxox user is actually an incredible feature because other apps like Line, WeChat, KakaoTalk, and Viber do not have this capability. Line, WeChat, and KakaoTalk force you to invite friends if you would like to communicate with them. Viber allows you to send an SMS message, but they use your cellular network to transmit the message which defeats the purpose of using this type of app. Voxox is the only app that allows you to send a non-user an SMS through VoIP versus your cellular provider. 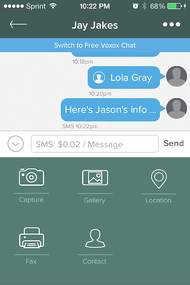 Voxox is an all-in-one communications app that can do this and so much more. If you have not downloaded Voxox, download the app today and take it for a test drive. It’s available for Android, iOS, and PC and Mac laptops. With Voxox your communication will never be the same! How will you use Voxox?